Analysis Debunks Absurd Sea Level Rise Claims About South Florida – Sea level rise in the Miami area is not accelerating and it is rising at a rate of about 1 foot per century. Climate Depot Reality Check: The feared sea level rise in Miami and Florida has failed to materialize. The latest studies and data has scientists speaking out about the unscientific claims of man-made climate change induced sea level rise. All of the sea level rise since 1700 is insignificant relative to the natural variability of Holocene sea levels. Sea level rise in the Miami area is not accelerating and it is rising at a rate of about 1 foot per century. I intentionally retained the “seasonal terms and mean” and did not smooth the data because the seasonal variability is real and at least 10 times the magnitude of any secular trends in sea level. To the extent that there is a trend (R² = 0.0945), the rate of sea level rise in the Miami area is about 3 mm/yr. This would lead to about 5.5 inches of sea level rise over the next four decades. 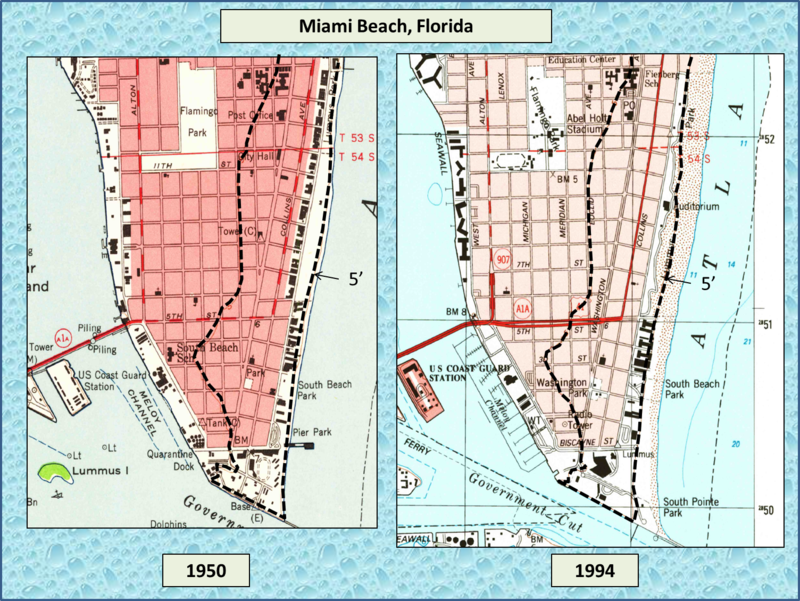 Miami Beach, Florida topographic maps from 1950 and 1994.(USGS). 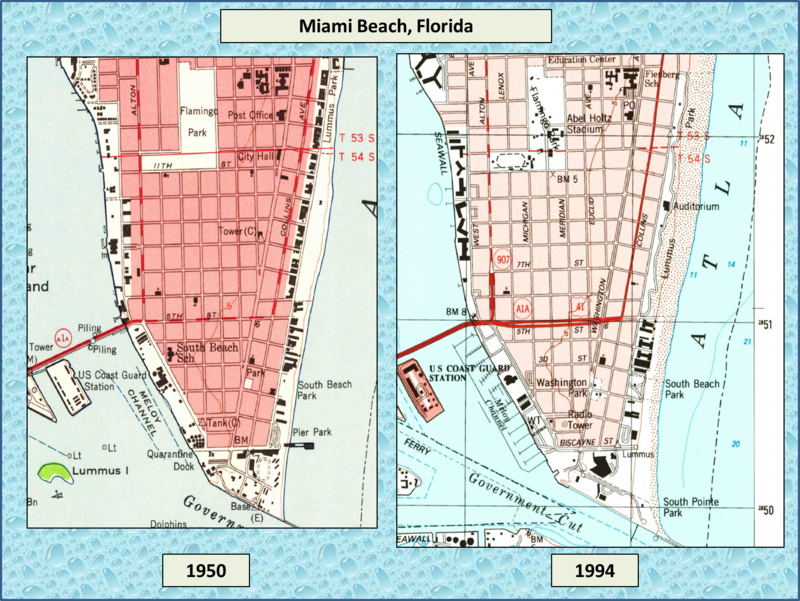 Miami Beach topographic maps for 1950 and 1994. Note that the 5′ elevation contour has not shifted (USGS). A 2013 study in the journal Global and Planetary Change found that global sea level rise decelerated 44 percent since 2004 to a rate of only 7 inches per century. 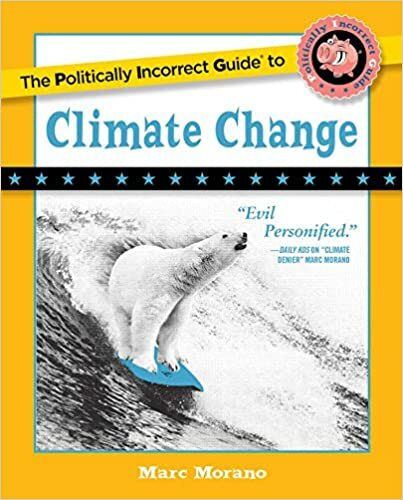 “If you look at the total global sea level from about 1850 until the present time it’s been rising at a fairly constant rate, rather slow—about 7 inches a century…. It’s about 1 to 2 mm a year so if you’re 50 years old you experienced a sea level rise about 3 ½ inches and you probably didn’t even notice it,” geologist Easterbrook has explained. “Sea has risen four hundred twenty feet since the end of last of glaciation period. And none of that had anything to do with people,” Greenpeace cofounder Patrick Moore points out. thermometers. And those different measures may not agree. In the case of sea level, you can pick tide gauges or satellite altimeter measurements. The tide gauges show sea level rising at a rate of less than the thickness of one nickel per year. If you want to show more pronounced sea level rise, you can use the adjusted satellite altimeter data, which began in 1992. The satellite data show sea level rising at twice the rate of tide gauges or slightly more than two pennies a year. Gore sequel claim: Global warming causing fish to swim in streets of Miami – “I went down to Miami and saw fish from the ocean swimming in the streets on a sunny day. The same thing was true in Honolulu just two days ago, just from high tides because of the sea level rise now.” Miami has unprecedented flooding and fish are now swimming in the streets. Gore in his sequel and in numerous media interviews hypes the fact that Miami has “fish from the ocean” swimming in “the streets of Miami-Dade and Delray, Ft. Lauderdale.” The film features Gore walking around the flooded streets of Miami with big boots on. But lucky for readers of this report, scientific data is available and trumps a man’s recollection of 40 years ago. Climatologist Dr. Roy Spencer debunked Gore’s claims on Miami and sea level. “One of Gore’s favorite tactics is to show something that happens naturally, then claim (or have you infer) that it is due to humanity’s greenhouse gas emissions,” Spencer wrote. “For example, sea level rise. Gore is seen surveying flooded streets in Miami Beach,” Spencer added. “Miami Beach occurs during high tides called ‘king tides,’ due to the alignment of the Earth, sun and moon. For decades they have been getting worse in low-lying areas of Miami Beach where buildings were being built on reclaimed swampland,” Spencer added. Miami Beach Public Relations Manager Melissa Berthier told The Daily Caller News Foundation that “flooding only happens during ‘king tides,’” which take place around April and October. She did go on to say that if enough rain falls during high tide, light flooding can occur. But reiterated floods do not happen as a normal occurrence during Miami Beach’s high tides. King tides happen when the sun and moon align on the same side of the Earth, and their resulting combined gravitational pull produces tides much higher than normal. Berthier said king tides bring flooding to Miami Beach twice a year, with the fall tide being “more severe” than the spring. Witness King Tides says on its website that “[King tides] aren’t part of climate change; they are a natural part of tidal cycles.” For reference, Miami receives just under 52 inches of rain a year, according to U.S. climate data. Sea levels have been rising since the last ice age ended more than 10,000 years ago. There is currently no acceleration in sea level rise. Former NASA Climatologist Dr. Roy Spencer in 2016: “Sea level rise, which was occurring long before humans could be blamed, has not accelerated and still amounts to only 1 inch every ten years. If a major hurricane is approaching with a predicted storm surge of 10-14 feet, are you really going to worry about a sea level rise of 1 inch per decade? Peer-Reviewed Studies Demolish Warmists’ Sea Level Rise Scares: ‘Decelerated 44% since 2004′ – ‘Global sea levels have been naturally rising for ~20,000 years and have decelerated over the past 8,000 years, decelerated over the 20th century, decelerated 31% since 2002 and decelerated 44% since 2004 to less than 7 inches per century. There is no evidence of an acceleration of sea level rise, and therefore no evidence of any effect of mankind on sea levels. It’s typical Al Gore scaremongering: Pick a place that floods every year and portray it as evidence of calamity.